After 21 games, I looked at how the NYR skaters had performed using a fun little competition visualization tool created by Petbugs13. 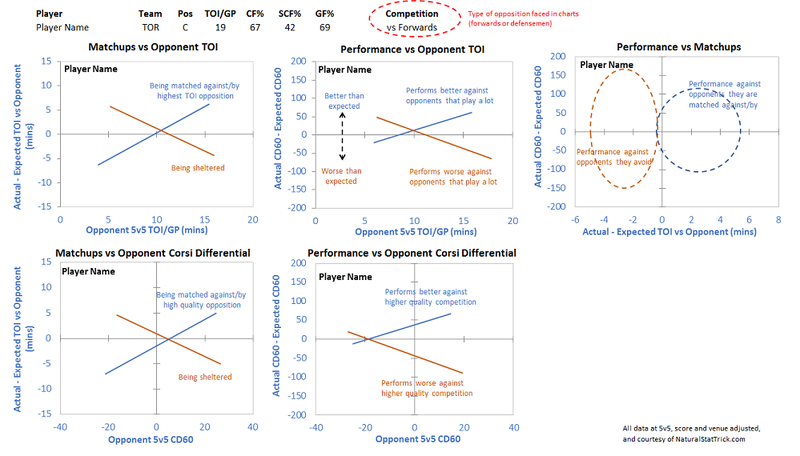 Without getting into the whole background again, the tool is a quick way to see how players are matched up against their competition (if at all), and how they perform against that competition. In this case "competition" is looked at both by how much time on ice the competition gets, and how good the competition's Corsi differential is. You can run the tool against opposition forwards and opposition defensemen. Here's the key to the charts I'll be posting, with some modifications I'll explain later. What you'll see below are the skaters 1st Quarter (through game 21) results compared to their 1st Half (through game 42) results. In other words - we'll see how the player improved/got worse in the 2nd Quarter (games 22-42). [Yes I know the NHL season doesn't fit into 4 even quarters]. Importantly, I have removed the first column shown in the above key chart, which shows whether the player was matched or not, because there were no noticeable difference for any NYR skater except for three. For today's look at the NYR against opposition defensemen, only J.T. Miller (slightly more matching), Brady Skjei (slightly more matching) and Brendan Smith (slightly less matching) had any visually noticeable changes. Instead of showing more charts that look the same, I'll just remind you of the player's matchup status. Also, rather than going through each chart and explaining what it shows, I'll just be pointing out any interesting changes. One final note: there is a slight axis change in the final charts (Performance v. Matchups) - not surprising now that we have more data. All data is 5v5, score and venue adjusted from NaturalStatTrick. J.T. Miller (neutral to slight match): Very little change for J.T. Miller. He was neutral to underperforming after 21 games, and he's the same after game 42. Kevin Hayes (neither matched nor sheltered [remember this is showing his matchups against opposition *defensemen* only]): Hayes results seem almost identical. Hayes continues to perform decently against his non-matchups, and isn't terrible against his matchups. Jesper Fast (slightly sheltered): Fast has basically gotten worse, except for a slight improvement against defensemen he is not matched up against. Marc Staal (neither matched nor sheltered): Staal's slightly improved his play against the "worse" defensemen (lower TOI, lower CD), and seen a slight drop in is performance against high TOI defensemen. Chris Kreider (neutral to slightly matched): Kreider's been pretty consistent, but for a slight decrease against the better Corsi defensemen. Kevin Shattenkirk (neutral to slightly sheltered): Shattenkirk's play seems to have dropped to the eye test, but there's almost no change here. Jimmy Vesey (neutral to slightly sheltered): Vesey's results have declined all around. Ryan McDonagh (neutral to no matching): McDonagh's results have slightly declined across the board. Paul Carey (neutral to slightly sheletered): With more ice time, Carey's results have noticeably dropped. Mats Zuccarello (neutral to no matching): Little change for the little man. Michael Grabner (neutral to slightly sheltered): Slight decline in Grabner's results. Brendan Smith (neutral to slightly sheltered): Smith was terrible after 21 games, and isn't much better after 42. Steven Kampfer (neutral to slightly sheltered): Kampfer didn't play much, so he's still Bad, except he's managed to improve his results against high CD defensemen (to be basically break even). David Desharnais (neutral to slightly sheltered): Went from bad to worse. Nick Holden (neutral to no matching): Holden was basically...[sunglasses]...Holden his own before, but now he's underwater. Rick Nash (neutral to slightly matched): Little change for the big man. Brady Skjei (neutral to slightly matched): Slight decline for Skjei in the 2Q. Pt4vel Buchnevich (neutral to slightly matched): Basically the same results for Buch, with some decline in performance against better CD defensemen. Mika Zibanejad (neutral to slightly matched): Not much to see here. The DJ's been OK, performing basically as expected. On this Rangers team, that basically makes him the MVP of the skaters. While I don't read too much into these results, I do think its telling that basically none of the NYR skaters improved their results in the 2nd quarter. In the next post, I'll look at how the NYR skaters fared against the opposition forwards.